With race and class out of the way, we can now move into the self-actualization of gender identity through an intersectual lens. Or, we could discuss rules for coming back from the dead. Again. (That can be interpreted as “coming back from the dead more than one time”, or “another time we’re discussing rules for coming back from the dead”. Actually, both are correct. We discussed resurrection before, but Dave Hargrave has more to say on the subject. We also look at a radical change to the hit point system, and some other stuff. Contrary to the popular myth that old-school gaming treated death more seriously, the “revolving door afterlife” was a running gag from pretty much the earliest days of the hobby, as were attempts to jam a crowbar into said door, or at least slow down the rotation a bit. It is true that starting characters were a lot more fragile back then, and surviving to the point where you could access the magic that could bring you back was more difficult, but once you’d reached mid-levels (often very quickly if the DM was careless about magic items which could be sold for gold that in turn became XP), death was mostly a speedbump. DMs didn’t like this, of course — what was the point of having traps that killed characters in hideously fiendish ways if they were back the next day? — and so, variant rules abounded. Digressing momentarily: There’s a strong connection between the depth of character creation and the survivability of said characters… or there should be. 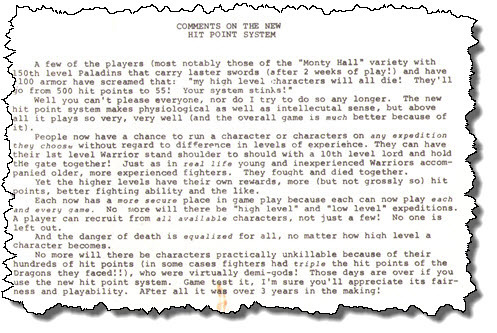 One common design trend in early spin-offs of D&D was to dramatically ramp up the number of steps needed to create a character, while not making it much harder to die, both in the name of “realism”. This was self-evidently frustrating and annoying. Something had to give, and since a high degree of customization was more desirable than dying easily, game design shifted towards much tougher starting characters. “Hours to create, a second to eviscerate” is no longer a popular design trope. Anyway, back in Welcome To Skull Tower, Dave gave us some percentage chances of resurrection by race, level, and constitution. Now in the Runes Of Doom, Dave expands on that chart, adding in more conditions, explanations, variations, and perturbations. You can only be resurrected within 30 days. For each day from death, the chance of resurrection (from the Skull Tower chart) decreases 3%. You get three trys(sic), unless you’re an elf, who only has one. The second try is at a -20% chance, the third is at a -50% chance. Keep track of how many trys(sic) it took to resurrect you; it matters. IRREVOCABLE or PERMANENT death requires a LIMITED WISH and a “raise dead fully”, a FULL WISH, or a GODLY GRANT. (All CAPS in ORIGINAL.) Saying death is “irrevocable” unless you cast a higher level spell is like saying something is not for sale, unless you have the money. If you are disintegrated or 100% destroyed (which means taking over 200% of your hit points in acid or fire the like), resurrection requires THREE WISHES: One to reunite mind and body, one to reunite body and soul, and one to reconstruct the body from the free-floating atoms it has become. However, only one GODLY GRANT is required. The wishes must be used within an hour of each other. The wishes must be worded correctly, or the gods will “interpret” them as they see fit. The “wish lawyer” was a common feature at gaming tables in the 1970s. And don’t think you can escape the long healing times of severe spinal injuries, just because your torn and mangled body has been recreated with those injuries erased! And it does, until you realize players are concerned with the letter, not the spirit, of the law. Under these rules, four Cure Light… I mean, Heal Lesser… Wounds spells will restore any character, at any level, to full health. This greatly reduces the need to memorize higher-level healing spells. (Remember, at the time, there was none of this “swap out any prepared spell for a Cure spell” stuff!) It means a few Cure Light Wounds potions or scrolls can replace far more expensive and rare magic. Etc. However, this was partially miitgated by one of the more dramatic changes to the core D&D paradigm: Tossing (mostly) hit point inflation out the window. Everyone gets 1 HP per point of Constitution. Fighty and Thiefy types (including, oddly, Normals) get 1 HP/level. Clericy types get 1 HP/2 levels. Wizardy types (and Courtesans) get 1 HP/3 levels. Star Powered Mages never get extra hit points, because reasons. 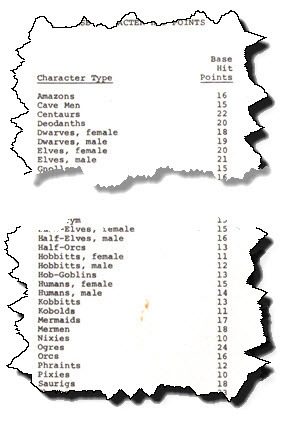 Multiclass characters get all the hit points they’d get for their levels in each class, which isn’t a great system under the dominant multiclass rules at the time, as, given the same XP, a pure Fighter might be 11th level, while a Fighter/Thief would be 10/10… or have nearly twice as many bonus hit points as the 11th level fighter. Half-Orcs Have Worse Hit Points Than Either Humans Or Orcs? Fighters get +5 on top of this, Clerical types 3, and pointy-hat wearing finger-wagglers get 0. In addition, for every Constitution point over 12, you get 1 bonus hit point. Next follows a rant aimed at “Monty Hall(sic)” players… huh. I can’t imagine why a setting known for its mu-meson swords, 50th level merchants, and 15th level spells would attract those types… it deserves to be presented in its entirety. Following this massive revision of resurrection, healing, and hit points, we have a tiny little chart (about 1/5 page) about guild fees. This is the only thing on the page. Way to waste paper, Dave. The next bit goes back to ‘highly dense page of teeny-tiny type’ mode, filled with even more rules and variations on combat. I’m on a tight schedule, so, we’ll do that next week. We’re up to Page 29, about a third done with the third book, if anyone cares. The change to cures wouldn’t be as “breaking” as you describe if the letter of the law…er spell…was given as a hard limit. For example, if a light wound spell could not heal a character that had suffered more than 25% damage, or a grievous wound cure was required for a character that had lost 50-75%.